You can create your own 12 days of Christmas song with articles that are significant to your group of friends. This can be any number of people - if you have more than 12 then divide into rough teams. The song is broken into parts and each person/group have a part to sing. Some may have to repeat their parts. One person starts "On the first day of Christmas, my true love gave to me a partridge in a pear tree". 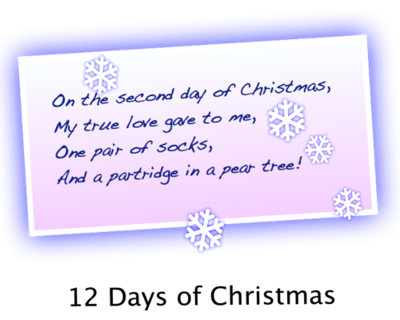 The next person then sings "On the second day of Christmas, my true love gave to me, one pair of socks, and a partridge in a pear tree"
and so on...you substitute your own gifts into the song. It becomes very funny especially when you have to remind people when it's their turn to sing!